Peter Long on Chess: Was I Too Harsh? 1. 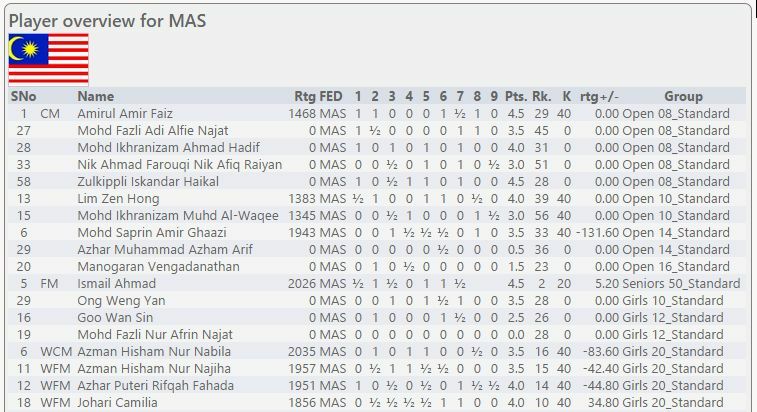 Let's start by ignoring Seniors 50 as Ismail has consistently done well as veteran but he hardly represents any sort of future for Malaysian chess. 2. We had three players highly regarded locally seeded in the top ten, in fact first, sixth and sixth but in the end they were 29th, 33rd and 40th. In short highly overrated in both our assessment (not mine) and their FIDE rating. 3. Only three with 4.5/9 made a 50% score. 4. The number of games lost was simply staggering and some had scores so bad (including one with zero) one can only wonder how MCF allowed them to play except it is well known that published selection policy does not count for anything with the idiots and incompetents (and crook?) that run Malaysian chess. Malay Mail Online: Upskilling Our Trainers? Mediocre... Again. Should I be Surprised?